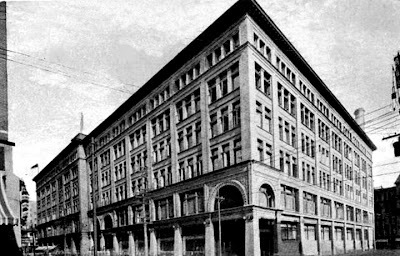 The Department Store Museum: The Robert Simpson Company, Ltd.
addition on the corner of Richmond and Bay Streets. focusing on the 1929 addition. restaurants in all of the world. "You'll enjoy shopping at Simpsons"
Simpsons Yorkdale now The Bay is one of my favorite stores. I believe its ugly really but in a charming way that reminds me of my youth in the USA and feels like department stores felt back then being their own self contained world. 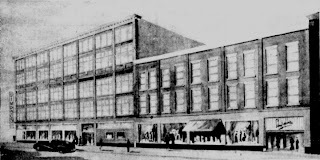 The Toronto Downtown Yonge and Queen store is still standing and is now a Bay Department Store. It still retains the historical character of Simpson's and on my most recent shopping trip a couple years back (2006), it was like going into a living museum. I had purchased two shirts and a pair of jeans and consider these items I bought museum artifacts that I treasure. If you want to see how a historic department store is like, go to the Toronto downtown Bay (the former Simpson's) next to the Eaton Centre. 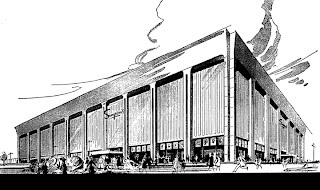 Growing up in Toronto and it was great going to Yorkdale and shopping at both the Eaton's & Simpson's department stores. I have two Simpson's Department store Christmas Carol song sheets. You were able to sing carols in the morning at 8:40am to 9:00am December 18 to December 24 (except on Sunday) on the Street level of the store in Toronto. I don't know what to do with them. I can't take myself to throwing them out. Why I don't know. I grew up in Halifax, NS where there were both Simpson's and Eaton's dept stores, in both Halifax and Dartmouth. I remember the Santas in each store. I miss these two fine Canadian companies. I worked in the Robert Simpson's Flowershop on Richmond Street across from the main store (at Queen & Yonge). The flowershop was located beside the parking garage. I have many wonderful memories of the Simpson's store, as I spent many of my lunch hours browsing the various departments. Although the flowershop was privately owned then ( I worked there 1980 to 1984) I feel very connectedt o the Robert Simpson Co. I have a HOOSIER kitchen cabinet. It still has the brass plate saying it was from the Robert Simpson Co. Toronto. It probably dates back to the 1920's and still looks great. But sorry to say I have to sell it. What a shame I have loved it forever. Has a different shaped mirror that hangs and swivels on spindles. Stain is dark & two tones. There is a pattern carved into front. Has metal ring handles. How old, how much it may be worth today. It is in original condition, wheels a bit worn over years, excellent condition. There are only a couple fade spots. I bought it 20 years ago at a sale in winnipeg,mb. I have used it for as many years as I have had it. I HAVE RECENTLY AQUIRRED MY GRANDMOTHERS BROOCH THAT SHE RECEIVED WHEN WORKING AT SIMPSON'S. SHE PASSED AWAY IN 1984, AND HAD BEEN RETIRED FROM SIMPSONS FOR SOME TIME. THE BROOCH IS THE SIGNITURE "SIMPSONS" WHICH IS WRITTEN IN RHINESTONES. I DON'T KNOW IF IT IS A SERVICE PIN OR RETIREMENT PIN. DID ANYONE RECEIVE ONE, WHAT WAS IT FOR, AND DO YOU KNOW AN APPROXIMATE VALUE OF THIS PIN. THANKS FOR ANY HELP YOU CAN PROVIDE. I worked at Simpsons Scarborough Town Centre in the Accounts area for 8 years (payments, refunds, gift certificates etc) from the day it opened. I trained at Cedarbrae in preparation. Thank you for putting this site together! I can hear the Christmas carols coming through the store speakers as I type... haha. I loved the Simpsons logo. I can't seem to find any pictures of their old store bags which were really stylish. I worked at the Queen St. store starting in 1968 and took the management course in 1970. From there I was sent to the new Fairview store as asst. manager of dresses, coats and the Room. A year later Sherway was in the works and I was sent in the same depts. for opening. Promoted to Dept. manager of most of the main floor at Yorkdale in 1971.Then asst. buyer in sportswear in the main store. I left in 1974 to start a family. My husband Doug Syer also worked in the Main Queen St. store. Very fond memories of the "family"
Just came across your blog, and it brought back many memories! Simpson's Queen Street Store was always my favorite, especially when visiting Toytown on the 4th Floor at Christmas. This store was also used as the backdrop for the popular 80's children's TV Show "Today's Special" and several episodes were filmed there. The Yorkdale store was also pretty spectacular, with the giant spiral staircase leading to the Court Room Restaurant (which is also now gone). It's a shame Simpson's is no longer around. It was a great store. The Bay is just not the same. Hello, I have a Picture framed at Simpson's the stick on back can anyone tell me about what year did Simpson's had a frame shop and what store had them. GWG jeans and signing autographs. 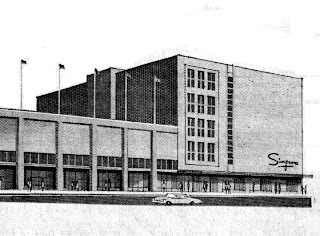 I remember as a child going shopping with my mother, and we would stop for a steamed hotdog and an orange drink in the lower level at Simpsons. I worked part time at Simpsons, Downtown Toronto between 1980 and 1986. I was A student and was hired as Christmas help I Toyland, then ended up staying on working primarily in the custom framing dept. I worked with a great group of people, (including Rita, Mary, Kim, Mary M, Del) what a great store it was. I also helped out in promotions, and met Wayne Gretzsky when he was promoting GWG jeans. I really enjoyed looking over your blog. I truly miss Simpson's and Eaton's. 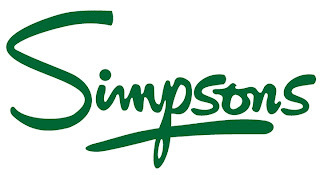 I remember the last time I was in a Simpson's store, which was the one on St. Catherines St in Montreal, now Simmons. The Bay just doesn't seem to have the charm that Simpson's had. I have two catalogs , one from 1917 and the other from 1924. Does anyone know what they would be worth and where I can find info on them . I have china marked Thomas Bravaria in green and stamped in red - The Robert Simpson Company Limited Toronto. The border pattern is alternating blue and pale yellow background segments each containing various colored flowers. The center of each plate / saucer is white with a thin gold border .. any idea where I can get more info. on this china ? I still have my Simpson's credit card. I grew up in London where Simpsons was the big downtown store. The Christmas windows were a destination for all families and we still remember those times. Expanded several times the store had a great 6th floor Arcadian Restaurant that overlooked the market below and the city in the distance. When Eatons arrived in London in 1962 in an enclosed downtown mall, Simpsons met the challenge by enlarging and modernizing the store. Briefly a Bay store, the building now mostly houses offices. Ah, the memories! 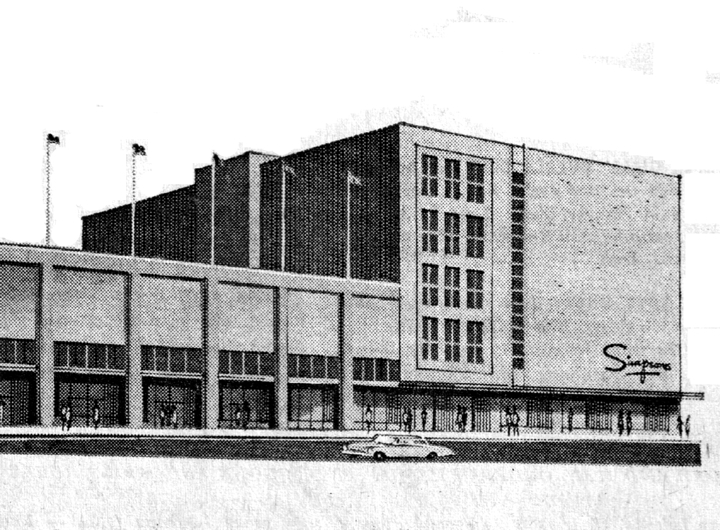 When I grew up in the late 50's early 60's Simpson's was the only department store in downtown Regina. Eaton's for some reason was located in the warehouse district to the north of downtown and was rather frumpy. Of many memories, some of my favourites were when they installed automatic elevators and got rid of the elevator operators and better yet when they installed escalators linking all six floors of the Regina store. I remember riding all the way up and then all the way down and maybe repeating it again! Also, the Christmas windows were a popular must-see. 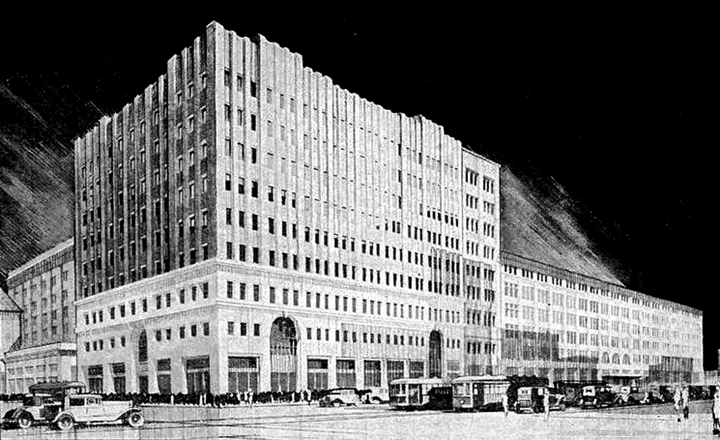 We shall never see such grand department store days like those ever again. And your money refunded cheerfully. and I can't recall the last line in the ad. It would be nice if someone had a recording of this and could post it on the internet! I had completely forgotten this and as I read the words I could hear the tune. Thanks for that memory. Simpsons entered the Ottawa market by acquisition of Murphy-Gamble in 1972. Hello I have an Etching that is titled Phi Gamma delta That was done in 1929 by B Mac Donald. It was matted and framed by The Robert Simpson Company can anyone help me with this piece. I have an unopened package of miniture cars with Simpsons Logo on it and the cars are called Duramites. I cannot find them anywhere else. I would like to know if they are truly collectibles. My grandmother just gave me her mink coat she bought from Simpsons Fur Gallery many years ago. She paid quite a bit for it back then and it still looks brand new. Outstanding craftsmanship. It's sad how the Bay took a company that never operated at a loss, even during the Depression and ran it into the ground. I worked in Simpsons from 1973 to 1981. I worked in hardware then Simpson Security, I met a lot of nice people who worked at Simpsons. There was one clerk I will always remember Tammy Quinton . She was a wonderful person. 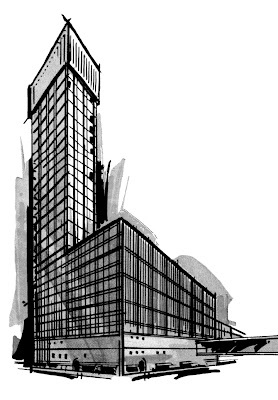 Market Tower was the original home of London’s largest and most successful department store - Simpsons. For most people living in the area in the 1950s, 60s, and 70s, a trip to see the Simpsons windows was a necessary part of the Christmas tradition. With new themes every year including “A Little Swiss Christmas,” “A Mouse’s Tale” and “Christmas with the Forest Folks,” windows were painstakingly decorated with whimsical settings and playful characters animated by light, movement and sound. Great blog. I have vivid memories of seeing Santa Claus at the Simpson's in downtown Montreal (I also recall getting lost and scared, but found). I also have fond memories of the Simpson's in Fairview Pointe-Claire. It was fun to go there - so ... Canadian. What truly wonderful memories. Thank you all for sharing. I used to meet my mom by the watch counter in the jewelery department at Simpsons, Queen and Yonge. It was our starting point for our little shopping expeditions. We'd work our way through the various departments always ending up on the 3rd floor, if memory serves correctly, where we would shop or at least imagine what we'd buy in the women's department. If the timing was fortunate we would be able to listen to the pianist. What a lovely atmosphere. I miss my mom and I miss Simpsons. I have a set of dressers with the Robert Simpson Company Limited Furniture name on them. Is there anyway I can find out what they are worth? Does anyone remember the Happy Face Cookies they sold!! I was wondering if anyone had the recipe as these were the best and I still crave over 30 years later!! The photo above of Simpson's in Regina should be 11th and Hamilton St. There never was a Howard. I worked in Simpsons wonderful Magic Display Department from 1966 to 1971. 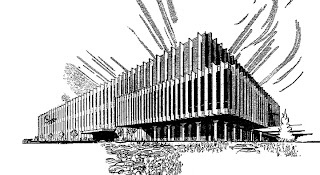 I had done done buisness school and Display training in Copenhagen Denmark, to where I returned in 1971.. I will never forget all the highly creative people I worked with, such as Billy Taylor, Lee Harris, Mark Thurman, Tony Ishmael, with Herb Holway and (Uncle Jack) Jack Prior in charge of the then 50 very talented staff , Some of us are still in contact after so many years. 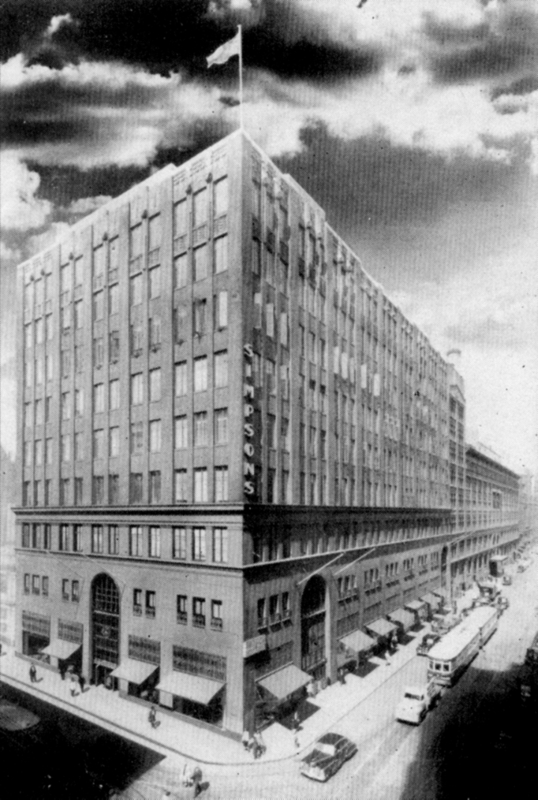 My grandfather, Herbert E. Burnett, worked at Simpson's prior to his death in 1933. He worked for them in London, England, circa 1904-1906, as a buyer, then returned to Toronto and became Vice President of Catalogue Sales. I remember seeing a book by C.L. Burton, a contemporary of H. E. Burnett, about his version of the history of the business but wonder if there are other publications available? Have enjoyed looking at the pictures and other people's comments which have brought back memories of visiting the downtown Toronto store as a child. 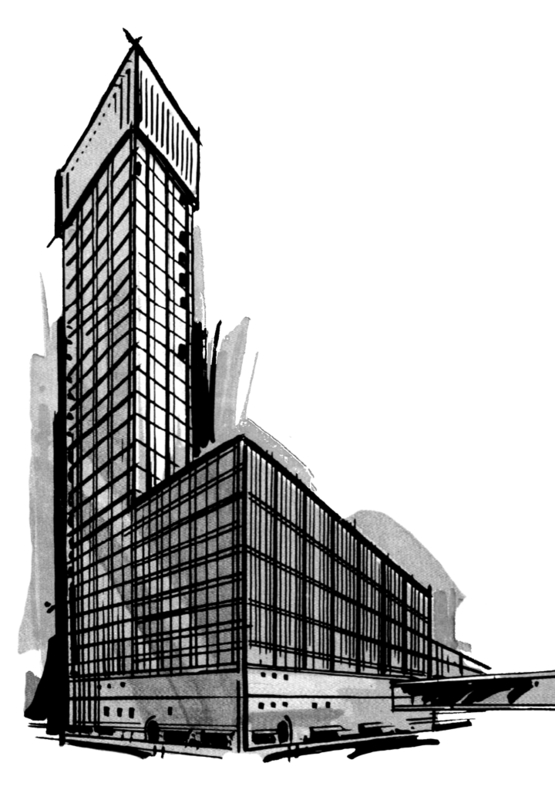 There was an english academy in that tower on the 24th floor in the late 70s. Do you remember its name? I have an old Simpson's Department Store associate name tag.Does anyone know if it is legal for me to sell it? 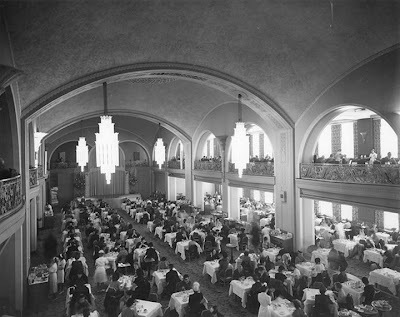 Im looking for original pictures of inside Simpson's department Store located in Downtown Toronto on Queen street. My wife died recently, she worked in the China Deptmt at Simpsons and spoke very highly of the Buyer in the 1960/70 years, I met him at the Frankfurt Fair, and I am going crazy trying to remember his name, can anyone help ? 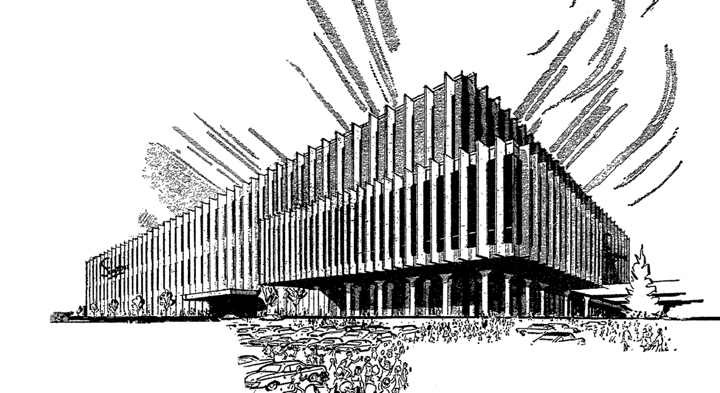 I worked in Simpsons Contract Division on Richmond St W, from 1956 to 1958; also for a short time in 1963. I was a very new emigrant but was made very welcome and look back on those years with great affection. Anyone remember those days? Great reading, as I worked at simpsons for 16 years. Good old arcadian court. Amazing place. Started as a dish washer to becoming the executive chef 1972 to 1982,left to open my own restaurant (Dantonys) Clovredale mall !982 to 2001. Great times. Hi Detty, I worked with Leslie Kotras from the mid 60èrs to 1971, and later meet up with him when I was back in Toronto. To my knowledge he had no children. Do You know what year he died, and perhaps where he is buried? I would be very interested in what You perhaps might know of he later years. My E-mail adress is: ovemog@gmail.com. From: Ove Mogensen, Gildbrostien 19, 2635 Ishoj, Denmark. Just found A Brand New "Simpson's" Calculator in case with instructions. Mint condition. No Date, Very slim, Maybe a promotional Material. Anyone Knows about this item? My father and I were in the Simpson TV commercial for the 100th Year celebration. It was done in Toronto on a Sunday. I remember the song we sang: 100 years of serving you; 100 years of growing too -100 years in every way we can surely say - You will love shopping at Simpsons and we'll enjoy serving you here. You'll enjoy shopping at Simpsons for another 100years. One could only have wished . . . Simpson's was such a great store! I was at Simpsons Downtown Toronto from 1983 to 1986, with most of that time in the Last Stop, Dept. 610, Budget Floor. I still have my green and my red badges somewhere. The Last Stop was always very busy, usually chaotic, and a lot of contingent student staff. The Manager was Mr. Douglas (Jack, a friend of mine) He came from the Toy Dept. originally. Mrs. Verna Cooper, Section Head, who was unforgettable, fought for her staff, and retired in the mid-1980's funny. Some stand out in my memory. Norm Henriques, from Mississauga, who retired at 65, Catherine M. McMillian, died from cancer, but one day she found baby mice in her shoe in the fitting room, Mary Priestley whos was another Beaches person, Mrs. Green. Mrs. Cumberland in the book dept., who was 71 years-old and worked harder than almost anyone. I had the Trim-A-Tree Dept. for a couple of Christmases, and Elwood Glover was there one morning, with his wife, hosting the Christmas Carol broadcast that was a fixture of Toronto radio then. The other managers who were around, were Tim Kelly, Danny Wall, Jim Maybin, and the Store Manager Mr. Wiseman who was a fearsome character with a flat-top brush-cut. Does anyone remember any of them? It was a great time, but it was hot in that basement in the summer, but the unusual characters who came through the store from the Subway were entertaining to see. I had the distinction of working for Eaton's Halifax and Corner Brook Nf 1973-1976 and Simpsons Halifax 1976-1979. At Simpsons I was area buyer and dept mgr for draperies and linens. I really enjoyed "going to market" in Toronto and Montreal. Meeting with suppliers. In 1969, I started in the Display Department when Jack Prior was the manager. Began in the art studio with Mark Thurman, then on to interiors, home furnishings, Queen Street windows, and finally Yonge Street fashion windows. I worked with Billy Taylor, Lee Harris, George Anderson, and so many Talented other people. I met and married my first wife while working there ... Janice Burton, daughter of G. Allan Burton & cousin to Doug Syer. To William (Bill) Carter. I worked at Simpsons from '74 to '92, mostly downtown. Started in the toy dept, then in the hardware, then on commission in furniture. I well remember the men you mentioned, Messrs Kelly, Wall, Maybin, and Wiseman. Yes, Mr. Wiseman was fearsome looking, and a man not to be crossed. Danny was also a tough nut, and a personal friend of mine. Working in the lower level for 4 years, I always saw the characters coming from the subway, and there were some beauts! Remember the dolly man? I enjoyed my years there, and made some great friends. As a student, I had the pleasure of working for Simpson's Toronto distribution centers (Lawrence Ave and Metropolitan Rd) from 1971 to 1977. I have many great memories from that time, especially from the Lawrence Ave Service building. Particularly those dedicated & loyal Simpsons 'big ticket' delivery drivers whose Simpsons branded trucks were a fixture on Toronto's streets. So many great people, from the front office staff, to the carpet (broadloom) cutting dept team and the Clearance Center sales staff. So glad I was part of it all.